Archive for tag "ECO14 London"
This is our preview of Ecosummit London 2013, our 6th cleantech conference that we hold for the first time in London. The agenda is online and presents 58 speakers including 31 startups and 15 sponsors. The growing list of participants features a promising startup and VC density. 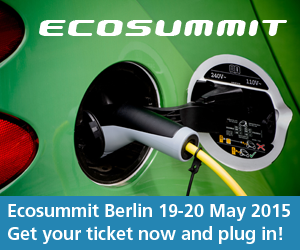 2 embedded Ecosummit TV videos show my introduction of ECO13 London and my opening of ECO13 Berlin. With 2 weeks to go, there is plenty of time to get your ticket and join us at the Crystal, the perfect location for our smart green family reunion. A unique experience for the participants will be the cable car pitch overviewing The Thames and Canary Wharf. Finally, it is our pleasure to share the dates of our next 4 events in Berlin and London in 2014 and 2015 for which we look for long-term sponsors and partners.